HP, like every other Windows-bent PC firm, has made its mission to outdo Microsoft’s own Surface line, especially in the workplace. The second attempt from HP, unveiled in Barcelona at MWC 2017, seems better suited than ever to enamor employees and IT leaders alike. This is the HP Pro x2 612 G2, the second version of HP’s business-focused take on, say, its HP Spectre x2 line of consumer-grade, 2-in-1 computing devices. For a starting price of $979 or €899, the Pro x2 612 G2 comes equipped with Intel’s 7th generation (Kaby Lake) line of fanless-focused Y series Core processors as well as a 12-inch, WUXGA+ (1,920 x 1,280) touch display and a built-in fingerprint reader for secure Windows Hello logins through Windows 10 Pro. Intel’s processors on offer, however, start with a Pentium Y series chip, then graduate to a Core m3 CPU before entering the beefy Core i5 Y and Core i7 Y chips. The rest of the spec sheet rounds out with no more than 8GB of memory in all configurations (bummer), and between 128GB and 512GB of solid-state storage ranging from M.2 SATA to M.2 PCIe Gen 3x4, one of the latest storage standards. Finally, the Pro x2 612 G2 rocks dual-band 802.11ac Wi-Fi, Bluetooth 4.2, both USB-C (3.1) and USB 3.0 ports as well as a microSD card reader, smart card reader and optional HSPA+ and LTE 4G broadband. But wait, there’s more: every Pro x2 612 G2 works with an optional HP Active Wacom Pen with App Launch features for the device. 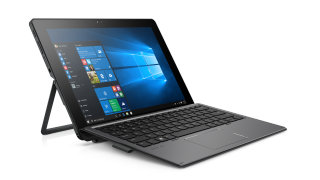 And, HP’s new-and-improved, aluminum Collaboration Keyboard – with full-size, backlit keys that feature one-press conference call functions – looks to turn this tablet into a laptop. Unfortunately, both will be sold separately for an unknown price when the Pro x2 612 G2 goes on sale in the US and EU, which is right now. HP’s hope appears to be that marquee features, like MIL-STD 810G-grade durability, a battery that’s promised to last up to 11 hours and charge up to 50% in just 30 minutes and the 165-degree kickstand in tandem with those slick accessories will allure the end users. Meanwhile, HP’s Sure Start Gen3 BIOS monitoring technology and its WorkWise office intelligence app is aimed to appeal to the IT leaders out there. For every model of the new Pro x2 available, you can see them on HP's business laptops page. Alongside the latest work tablet, HP has announced several new accessories for its Elite x3 and Pro x2 lines of products. Namely, the Elite x3 Mobile Scanning ($329; €999 with the phone) – a phone-based barcode scanner – and Mobile Retail ($999) – a more complete point-of-sale product – Solutions aim to subvert the Squares of the world, and both are available now. HP’s also putting out an Elite USB-C Dock in March for $149 (€129) that will allow any of HP’s USB-C devices to connect to this Thunderbolt 3 device for faster data transfers and more display options. A mobile version of this is available now for $49 or €49, while the real deal won’t land until sometime in March. Stay tuned for more in-depth takes from us regarding whether HP’s latest slate is worth your business’s bottom dollar.